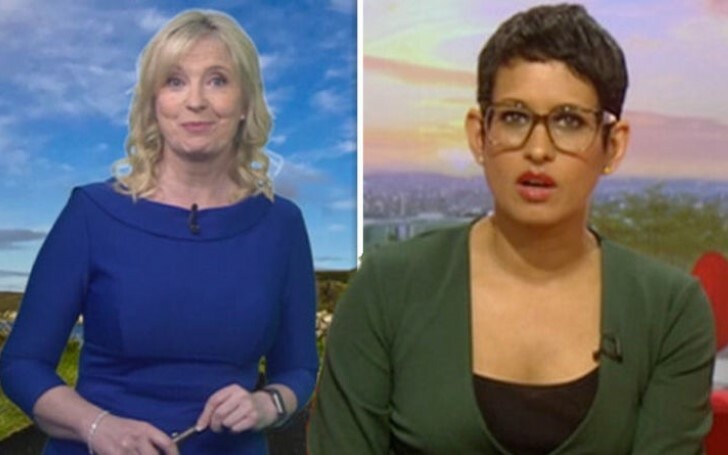 BBC weather forecaster Carol Kirkwood apologizes for teasing Naga Munchetty on The Breakfast Programme. BBC weather forecaster Carol Kirkwood apologized to fellow reporter Naga Munchetty for making yet another jokey spat on the Breakfast Programme BBC Breakfast on Thursday. The former host Naga Munchetty spats with weather presenter Carol Kirkwood after joking Naga will 'enjoy the colder temperatures'. But the joke ended quite awkwardly after Carol apologized for her words eventually. Carol Kirkwood, a 56-year-old beloved weather forecast reader on BBC Breakfast, and the team often enjoy teasing each other on daily basis. Carol and presenter Naga Munchetty have a long-running joke about not getting on the BBC show. Today, however, Carol went as far as to say she was “ashamed” for taking the mickey out of her co-host, gasping at Naga’s mock-indignance. Right after Carol read the latest weather forecast for the UK, she ended her speech with a warning to the reporters in the northern TV studio. "Temperature wise? Well back into those lower temperatures once again, which will thrill you I know Naga,” she said with a pointed glance. Naga, bursting into laughter and was shocked at Carol’s brazen comments. “Carol don’t you throw that back at me!” she declared. “I was about to say something very lovely!" Pretending to be affronted, Naga didn't resist sniping at the weather star. "Now I’m not, I’m just going to say see you later!” she snapped. Doubling over at the presenter’s dramatic comments, Carol could do nothing but apologize. Kirkwood immediately apologized and quickly admitted she "feels ashamed". She cried awkwardly: “Oh, now I feel ashamed!. I’m so sorry,” Carol went on to quickly add. “You should, you should feel really really bad,” Naga warned in a serious voice, before giggling with her co-host Charlie Stayt.